Designing a new bathroom? Take inspiration from this spa-inspired bathroom including a steam room, or see how other people have updated their homes by browsing our real home transformations. The owners: Sophie Parker-Hodds lives here with her husband Glenn and Ellie, their cocker spaniel. They are both retired. A two-storey extension to Sophie and Glenn’s house increased the size of the ground floor by a significant amount and had also made their upstairs bathroom larger. 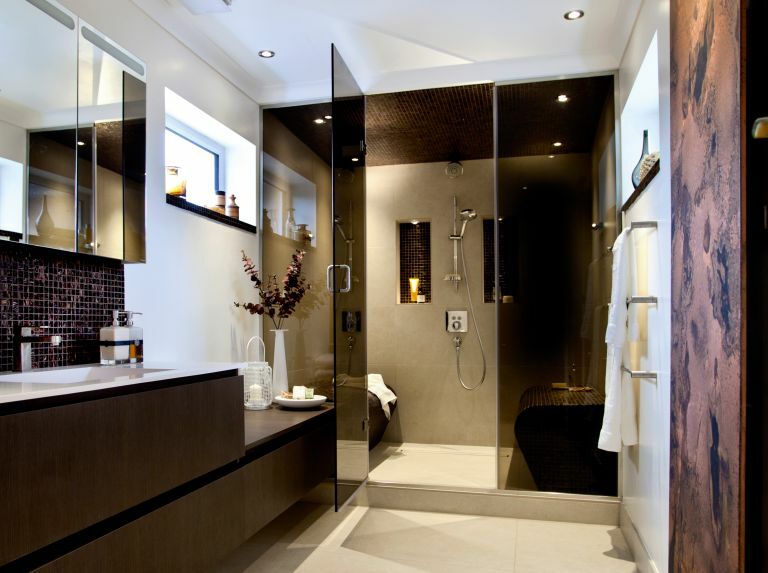 The couple agreed that installing a shower and steam room would make the bathroom something special; and a space that would get a lot more use. By chance, they discovered a neighbour was the financial director of a bathroom company that dealt with Swedish steam rooms. Martina Landhed, the design director, came to survey the room and explore the possibilities. The design includes benches either side of the space with smoked-glass panels and a door to seal it from the rest of the room. A long horizontal wall-hung unit houses all of the pipework and the steam generator, as well as providing space for storing towels. The coppery tones of a radiator Sophie fell in love with influenced the colour scheme. Martina knew that tailored storage was high on the couple’s wish list and recommended a mirrored cabinet with integrated lighting.